Hier kann man die komplette Geschicht des neuen Panama Kanals nachlesen, egal ob Start Entwicklung Schwierigkeiten alles zu l e s e n und auf Bildern zu sehen.Hat mir Spass gemacht das zu verfolgen, jetzt ist es geschafft. The Panama Canal closed its 2018 fiscal year (FY 2018) with a record tonnage of 442.1 million Panama Canal tons (PC/UMS), marking a 9.5 percent increase from 2017. The total tonnage for the year is greater than the 429.4 million PC/UMS tons forecast for FY 2018, as well as the 403.8 million PC/UMS tons registered in FY 2017. 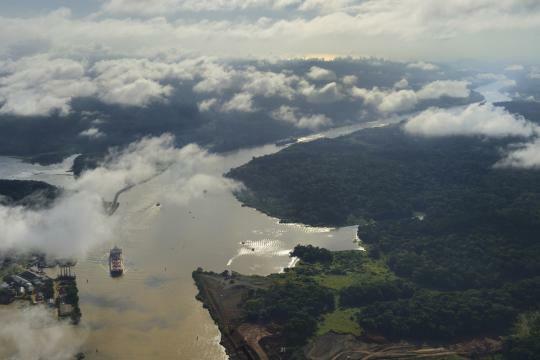 The Panama Canal Authority said the increase was driven by the transit of liquefied petroleum gas (LPG) and natural liquefied gas (LNG) carriers, containerships, chemical tankers and vehicle carriers. The container segment continued to be the leading market segment for tonnage through the Canal, accounting for 159 million PC/UMS tons of the total cargo, of which 112.6 million PC/UMS tons transited the Expanded Canal. Tankers – which include liquefied petroleum gas (LPG) and liquefied natural gas (LNG) carriers – represented the following market segment with 130.3 million PC/UMS tons. The next segments included bulk carriers (73.7 million PC/UMS tons) and vehicle carriers (49.5 million PC/UMS tons). In terms of cargo tonnage, the Panama Canal Authority said main routes using the Panama Canal in FY 2018 were between Asia and the U.S. East Coast, the West Coast of South America and the U.S. East Coast, the West Coast of South America and Europe, the West Coast of Central America and the U.S. East Coast and intercoastal South America. The main users during FY 2018 were the United States, China, Mexico, Chile and Japan. A total of 62.8 percent of the total cargo transiting the Canal has its origin or destination in the United States. 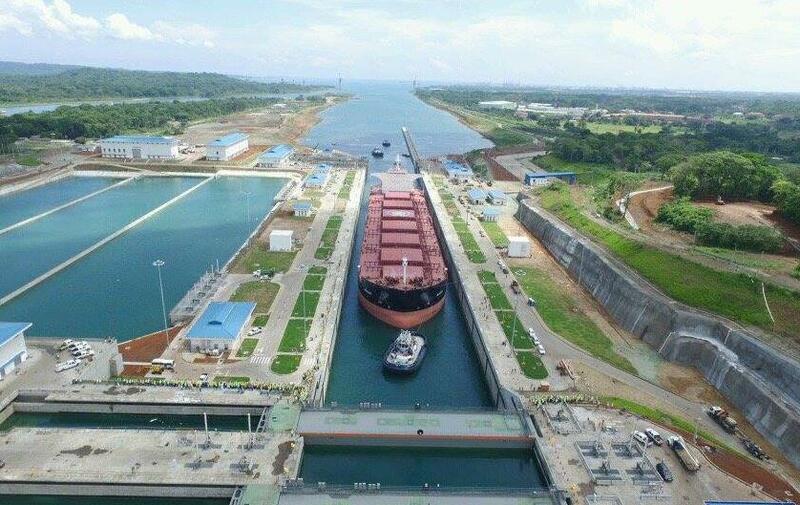 The Panama Canal Authority has announced it will increase the maximum allowable beam for vessels in the new Neopanamax locks by more than two meters, which will inevitably result in even-bigger ships using the waterway. The ACP said in an advisory to shipping this month that, starting on June 1, 2018, the new maximum allowable beam will be set to 51.25 meters (168.14 feet), more than two meters greater than the current maximum beam of 49 meters. 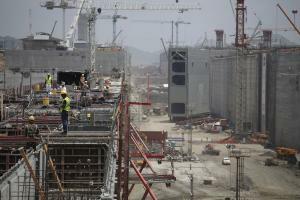 The beam is measured at the outer surface of a vessel’s shell plate and all protruding structures below the lock walls. 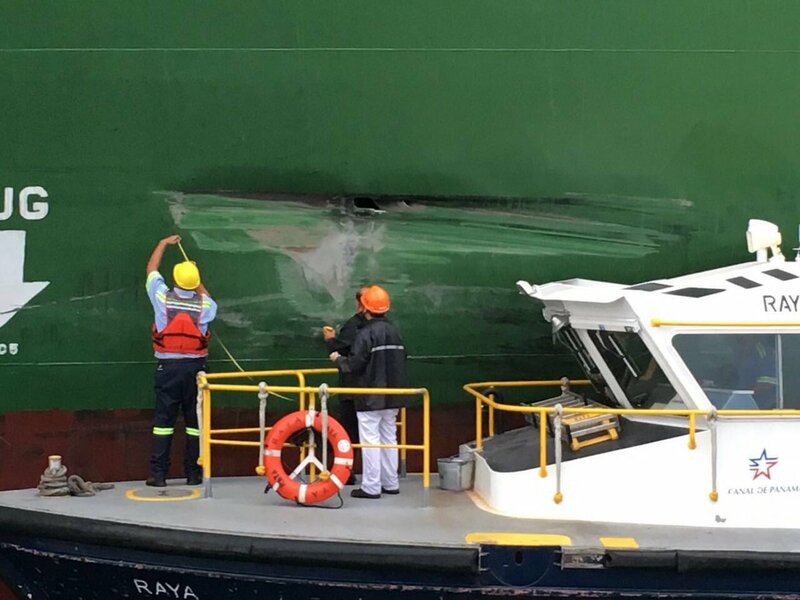 “After nearly two years of successful operations at the Neopanamax locks, the Panama Canal Authority is pleased to announce an increase in the maximum allowable beam for vessels transiting these locks,” the ACP said in a statement. 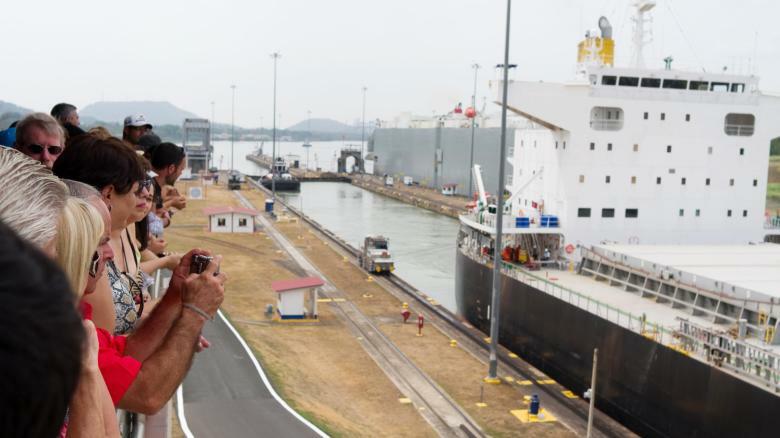 The Expanded Panama Canal opened to vessels in June 2016 and so far more than 3,000 vessels already transited through the new Neopanamx locks. Last August, the CMA CGM Theodore Roosevelt became the largest containership to pass through the Expanded Panama Canal’s Neopanamax locks during a voyage from Asia to the U.S. East Coast. The CMA CGM Theodore Roosevelt has a Total TEU Allowance (TTA) of 14,855 and measures 365.9 meters in length and 48.2 meters in beam. Less than a week afterward, CMA CGM Theodore Roosevelt sister vessel, CMA CGM J Adams, with the same dimensions, became the second ship with a capacity of more than 14,000 TEU to use the Panama Canal. Der Panamakanal verzeichnet nach seinem umfangreichen Ausbau einen weiteren Rekord: Mit der »COSCO Development« absolvierte jetzt das erste 13.092-TEU-Schiff die Passage zwischen Atlantik und Pazifik. Es ist das größte Schiff, dass seit der Eröffnung des »neuen« Kanals im vergangenen Juni jemals die Schleusenanlagen durchfahren hat, sowohl auf die Abmessungen als auch auf Transportkapazität bezogen, teilte die Kanalbehörde ACP jetzt mit. Der Neopanamax-Frachter ist 366 Meter lang und 48,2 Meter breit und werde in Kürze auch das größte Schiff sein, dass jemals einen US-Ostküstenhafen angelaufen ist, hieß es. Die nordamerikanischen Häfen sind von der Erweiterung des Kanals besonders betroffen. Auch dort waren umfangreiche Arbeiten nötig, um Carrier dieser Größe künftig abfertigen zu können. Die Entwicklung zeigt bereits Wirkung, diverse US-Häfen meldeten in den vergangenen Monaten Rekordumschlagmengen, was auch auf den Ausbau des Panamakanals zurückgeführt wird. Seitdem jetzt auch größere Frachter die Passage absolvieren können, wächst die Zahl der Neopanamax-Einheiten im Kanal stetig an. Mittlerweile waren es 1.200 Schiffe – laut ACP rund 5,9 pro Tag. Der Meilenstein von 1.000 Passagen war vor wenigen Wochen erreicht worden. The Panama Canal Authority celebrates another milestone less than nine months after the expansion: With »MSC Anzu«, the 1000th vessel of the Neopanamax type has transited the waterway. The containership was heading northbound from the Atlantic to the Pacific Ocean, measuring 299.98m in length and 48.23m in beam with a carrying capacity of 9,008 TEUs. During its transit, the ship called at Panamanian port terminals on the Pacific and Atlantic to discharge and load cargo on the way to its final destinations. »Today’s transit represents a considerable milestone, marking the industry’s strong adoption of the Expanded Canal and its successful operations thus far,« said Panama Canal Administrator Jorge L. Quijano. According to the statement, the canal is experiencing a steady flow of traffic – including containerships, liquid petroleum gas vessels, and liquefied natural gas (LNG) vessels. Other segments like dry bulk carriers, vehicle carriers, and crude product tankers have also transited through the Expanded Canal. The container segment accounts for nearly half the transits through the Expanded Canal and represents its principal source of traffic. 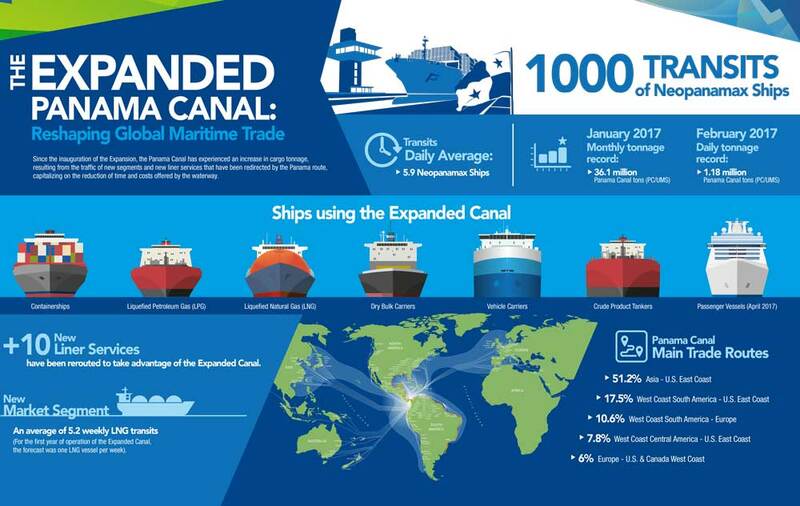 53% of containership cargo transiting the waterway does so using the Expanded Canal. As of March 2017, the average number of Neopanamax vessels transiting the new lane per day is 5.9. Traffic at the waterway continues to increase with each passing month. In February 2017, the Panama Canal set a new daily tonnage record of 1.18 million Panama Canal tons (PC/UMS) after welcoming a total of 1,180 vessels through both the Expanded and original locks. The previous records were established in December 2016 and January 2017, when the waterway set monthly tonnage records for transiting 35.4 million PC/UMS and 36.1 million PC/UMS, respectively. The ACP added, that many major liner services have already redirected service to the waterway. Thus far, 13 Neopanamax liner services have been deployed through the new locks, primarily on the U.S. East Coast to Asia trade route. And on April 1, two additional Neopanamax liner services are expected to follow, bringing the total liner services to 15. A couple of days ago, the ACP announced plans to launch a state-of-the-art vessel scheduling and maritime resource management system to optimize operations, uphold exemplary safety standards, and increase the efficiency and reliability of services as it handles this uptick in traffic. 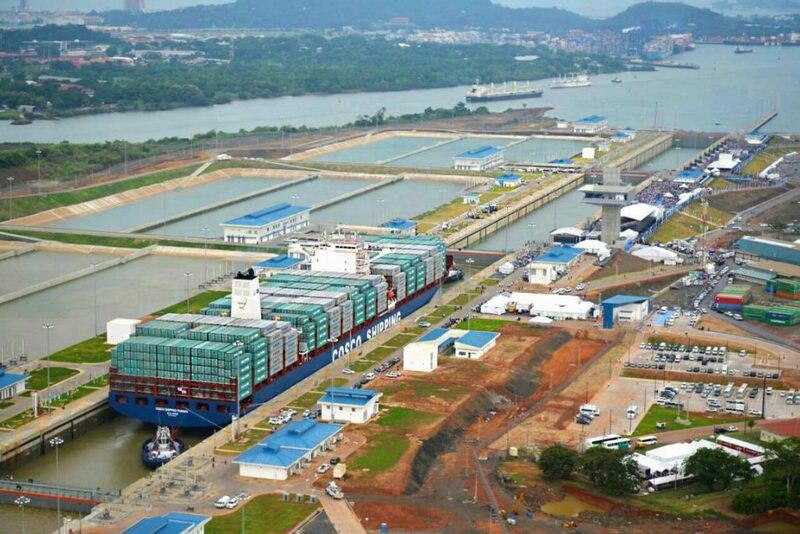 The Panama Canal has handled 330.7 million tons of goods in fiscal year 2016, the third highest amount ever recorded, contributed by strong container traffic, newly introduced segments and the expanded canal. In January 2017, the Panama Canal set a new monthly tonnage record of 36.1 million Panama Canal tons (PC/UMS), with the transit of 1,260 ships through both the expanded and original locks, the canal authority announced. The previous record was set in December 2016, when 1,166 ships transited the waterway reaching a total of 35.4 million PC/UMS. 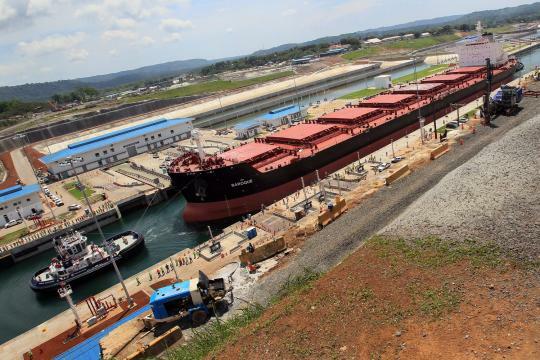 “This increase reiterates the importance of the Expanded Canal, and it’s further proof of the maritime industry’s continued confidence in the Panama Canal and the impact it will have on the future of global trade,” said the Panama Canal Administrator Jorge L. Quijano. Before the inauguration of the expanded canal on June 26, 2016, the monthly tonnage record was 30.4 million PC/UMS, which was set in October 2014. The expansion program included the construction of a new set of locks on the Atlantic and Pacific sides of the waterway and the excavation of more than 150 million cubic meters of material, creating a second lane of traffic and doubling the cargo capacity of the waterway. The expanded locks are 70 feet wider and 18 feet deeper than those in the original canal. Seven months after the beginning of operations, the expanded canal has transited more than 750 Neopanamax vessels – more than 50 percent of which were containerships. In addition, the expanded canal has accommodated liquefied petroleum gas (LPG) and liquefied natural gas (LNG) vessels, as well as bulk carriers, tankers and vehicle carriers. What is more, in April 2017, the expanded canal is scheduled to welcome the passage of the first Neopanamax cruise ship. Neopanamax passenger vessels are capable of transporting up to 4,000 passengers, nearly twice as much as the Panamax vessels that are able to transit the original locks. The Panama Canal Authority (ACP) in August started accepting booking requests from Neopanamax cruise ships for transit dates beginning April 1, 2017. A total of 13,114 vessels transited the waterway during the fiscal period from October 1, 2015 to September 30, 2016. 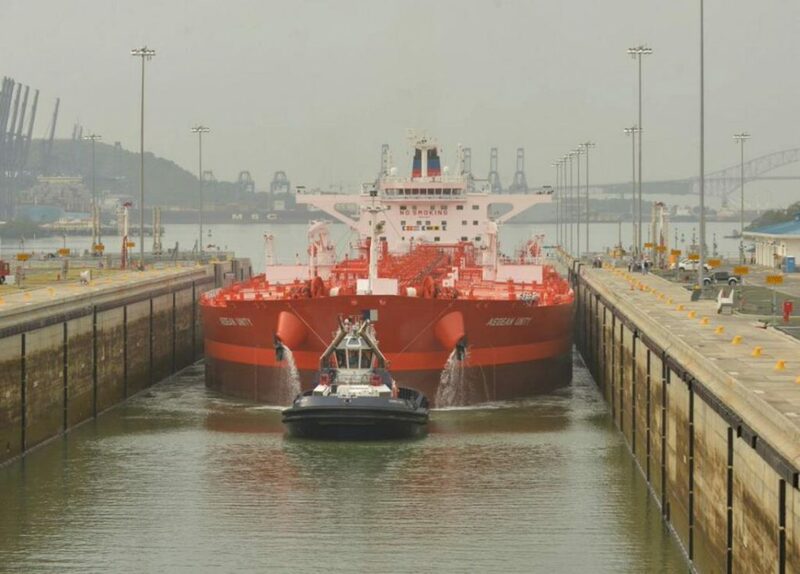 Of these, 238 were Neopanamax vessels that took advantage of the expanded canal during the first three months of its operation, accounting for 18.2 million Panama Canal tons (PC/UMS). “Despite the international shipping downturn this past year, we recorded one of the highest annual tonnage figures since the opening of the original canal 102 years ago,”Jorge L. Quijano, Panama Canal Administrator, said. “This latest success reinforces the continued strategic importance of the route and the growing value that recent investments in the canal will bring to the maritime industry,” he added. Since opening, the expanded waterway has seen major liners redirect service to the waterway to take advantage of the route’s significant time savings, according to Panama Canal. So far, nine Neopanamax liner services have been deployed through the new locks, primarily on the US East Coast to Asia trade route. An additional Neopanamax liner service is expected to follow suit next month. The container segment continued to be the leading source of canal traffic, accounting for more than 36 percent of the total cargo received. Container vessels contributed 119.6 million PC/UMS, including 13.4 million PC/UMS that passed through the expanded canal. The next leading segments by tonnage were bulk carriers with 65.6 million PC/UMS, tankers with 55 million PC/UMS, and vehicle carriers with 46.7 million PC/UMS. In FY17, the Panama Canal will continue its focus on enhancing the logistics infrastructure in Panama by advancing projects such as the Corozal Container Terminal, which is currently in the bidding stage. Posted on October 20, 2016 with tags Cargo Tonnage, Panama Canal, Volume. In this video the Panama Canal Pilots work with California pilots to asses the risk of, and prevent, an incident within the newly expanded Canal. 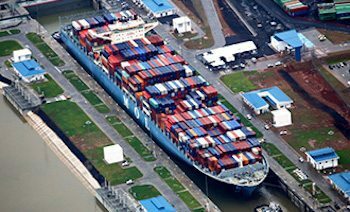 With the opening of the Panama Canal expansion in June, it was to be expected that the waterway would shatter all sorts of cargo volume records, but with the canal’s added capacity one figure in particular stands out: $829,468. 49 Meter breit und bis zu 366 Meter lang können Schiffe sein, die künftig den Kanal zwischen Atlantik und Pazifik befahren können. Bis zu 14 000 Container können sie transportieren. Mit riesigen vergrößerten Schleusenanlagen werden die Schiffe rund 26 Meter über den Meeresspiegel in den künstlich aufgestauten Gatún–See gehoben. Außerdem wurden die Fahrrinnen des Sees vertieft. Bislang wurden nur Schiffe mit maximal 4400 Containern geschleust. Das Megaprojekt kostete mindestens 5,25 Milliarden US–Dollar (4,62 Milliarden Euro). Kanalverwaltung und Baukonsortium streiten aber noch um Zusatzkosten in Höhe von 1,6 Milliarden US–Dollar. Über den 1914 eröffneten Kanal werden rund fünf Prozent des Welthandels abgewickelt, der jährlich zwei Milliarden US–Dollar in die panamaische Staatskasse fließen lässt. Durch den Kanal sparen sich Schiffe die zeitintensive Route über Kap Horn an der Südspitze Chiles. Eigentlich sollten die Ausbauarbeiten bis zum 100. Geburtstag des Kanals abgeschlossen sein. Doch Streiks und ein Streit über die Finanzierung verzögerten die Erweiterung. Die „Cosco Shipping Panama“ macht den Anfang. Der 9500-Teu-Containerfrachter hat per Losentscheid das Privileg erhalten, als erstes Schiff die neuen, größeren Schleusen am Panamakanal zu durchfahren. Im Beisein von zahlreichen hochrangigen Staatsgästen wird am Sonntag der erweiterte Kanal für den Verkehr freigegeben. Es soll der Beginn einer neuen Ära sein. „Wir begrüßen die Erweiterung des Panamakanals“, heißt es bei der weltgrößten Linienreederei Maersk Line auf Nachfrage der DVZ. Die Möglichkeit, den Kanal mit größeren Schiffen zu befahren, eröffne den Linienreedereien neue Möglichkeiten – insbesondere in den Diensten von Asien nach der US-Ostküste. Zur Erinnerung: Bisher konnten nur Panamax-Containerschiffe mit bis zu 5100 Teu Kapazität passieren. Künftig können die Schiffe 13.000 bis 14.000 Teu groß sein. Konkurrent Hapag-Lloyd hat bereits neue Schiffe bestellt. Fünf 10.500-Teu-Neubauten sind geordert worden und gehen ab Oktober in Fahrt. Vier davon werden in einem neuen Dienst zwischen der südamerikanischen Westküste und Europa fahren und damit die größeren Schleusen nutzen. Der erste Neubau wird voraussichtlich kurz vor Weihnachten den Kanal das erste Mal regulär passieren. Prof. Burkhard Lemper vom Institut für Seeverkehrswirtschaft und Logistik geht davon aus, dass die Linienreedereien ihr Angebot auf den relevanten Strecken günstiger und flexibler gestalten können. Kosten- und Ratensenkungen, aber auch ein zunehmender Wettbewerb seien wahrscheinlich. Die Verlierer der Entwicklung seien die bisherigen Panamax-Schiffe, da sie wirtschaftlich oft nicht mehr konkurrenzfähig seien. Angst davor, ins Hintertreffen zu geraten, hat aber auch die Kanalverwaltung am Suezkanal, durch den bisher auch einige Dienste von Asien zur US-Ostküste gehen. Diese könnten nun umgeroutet werden. Kampflos räumen die Ägypter das Feld aber nicht und locken mit einem 65-prozentigen Nachlass auf die Kanalgebühren. Dieser Eintrag wurde veröffentlicht in Schifffahrt News, Der Kanal, Entwicklung Containerschifffahrt von 2006 - 2017, Vergleich NOK Panama Suezkanal, Schifffahrt, Aktuelle News von g.goettling. Permanenter Link des Eintrags.